What are the documents that need to be submitted to a bank for a loan? Proof of Identity (Any one): PAN/Passport/Driver’s License/Voter ID Card. Proof of Residence/ Address (Any one): Recent copy of Telephone Bill/ Electricity Bill/Water Bill/Piped Gas Bill or a copy of Passport/Driving License/Aadhar Card. Occupancy Certificate (in case of ready-to-move property). Payment Receipts or bank account statement showing all the payments made to Builder/Seller. Salary Slip or Salary Certificate of last 3 months. Copy of Form 16 for last 2 years or a copy of IT Returns for last 2 financial years, acknowledged by IT Department. Certificate of qualification (for C.A./ Doctor and other professionals). How much time does it take for the house loan to process? The loan approval process can take 15 to 30 days. The actual time will depend on documents and the smooth scanning of the documents. What is a subvention scheme? Subvention scheme allows the concerned person to not pay any Pre-EMIs till fixed period or possession i.e., all the interest till fixed period or possession will be paid by the developer. So, basically, you own property without having to pay any interest till the fixed period or possession. What is the difference between EMI and Pre-EMI? Full EMI: Full EMI repayment of a home loan is the payment of principal as well as interest. This payment begins after the construction of the house is complete. Loan disbursal: The full EMI option is more apt for a one time disbursal of the entire loan amount. The pre-EMI option is suitable when loan disbursal happens in parts. Interest rate calculation: The interest of pre-EMI is compounded based on the loan amount disbursed to the developer unlike the interest of Full EMI which takes into account the entire loan amount. Loan repayment tenure: Since the monthly installments under full EMI contribute to the principal amount, the debt is repaid sooner by choosing this option compared to the pre-EMI option. EMI payments: The monthly payments begin from the start of the construction for the pre-EMI option. Whereas, the EMIs for the full EMI option starts only after the completion and possession of the property. Impact on the components of loan: With the payment of each monthly installment using the full EMI option, the principal amount and tenure get reduced. On the other hand, the EMIs paid using the pre-EMI option do not have any impact on the principal amount, loan repayment tenure, or rate of interest. Resale of property: With pre-EMI, the borrower will be able to sell the property right after or within a few years of its completion. On the other hand, individuals who have availed the full EMI option may not be able to sell the concerned property for a certain period of time. Impact on finances: Paying pre-EMI can be easier on the pocket owing to the fact that the borrower has to only pay the interest during the pre-construction period while this might not be the case with the full EMI option. Those who wish to save money during the pre-EMI period and invest it in such a way that they get good returns on the amount. Those who wish to pay the home loan by the time of possession of property. Both pre-EMI and full EMI repayment method for home loan enjoy the same tax benefits. The tax deduction is not applicable during the under construction phase. However, once the borrower obtains the possession certificate, the amount paid as interest (in pre-EMI or full EMI option) will be aggregated and is considered for a tax deduction in 5 equal installments. A pre-approved home loan is an offer for a loan based on your repayment capacity. The disbursal of the home loan is subject to you identifying a property within the validity period of the pre-approved loan and the property meets the lender’s legal and technical due diligence requirements. Loan effective property search: By having a clear picture of you, you can focus your search on affordable properties. Negotiations with seller: With a pre-approved loan offer in hand, you have a better bargaining power with the property seller. Quick processing: As lenders finish the credit appraisal in advance, the turnaround time on the entire loan process (from loan approval to disbursement) is reduced. You do not have to miss out on a good property deal or worry about an increase in prices. Interest rates: With pre-approved home loans, you do not have to worry about the interest rates going up by the time you choose a house and apply for a home loan. How can I get a pre-approved loan? Loans are pre-approved by banks based on your credit history and previous loan repayments if any. Last 6 months Bank Account Statements for all Bank Accounts held by the applicant/s. What is the validity of a pre-approved home loan? The pre-approval is open only for a maximum period of six months and if you do not apply within this period, it becomes null and void. The validity period might vary from bank to bank. Once, the validity expires, you will again be charged the processing fee for the loan. How to select the bank for taking a home loan? Interest rate: You should find out if the rates are fixed or floating. As opposed to Fixed Rates, Floating rates vary according to market conditions. For shorter loan tenure of 2-5 years, it is better to opt for fixed rates. But for a longer tenure, floating rates work best. Pre-Approved loans: Banks with your salary account might offer you a pre-approved loan. This has certain advantages like less documentation and faster processing. Processing charges and prepayment: The processing fee is the charge banks deduct for processing the loan. This can be anywhere between 0.25%-2% of the loan amount and varies from bank to bank. Documentation: Though most lenders seek the same documents, like proof of age, address and income, actual requirements may vary. Turnaround time: The time taken to sanction and disburse home loans varies from bank to bank. There are a number of post-disbursement services involved. These include getting regular account statements and interest certificates on time every year. Choose a lender with strong systems and a good record of after-sales service. Pre-approval on Property/Developer: A lot of projects are pre-approved for availing home loans for buying a property in that project by a certain number of banks. This means that the bank has done due diligence on the legal aspects of the property and only then approved the property beforehand. So whether or not you avail a loan from that bank, you can conclude that the project is safer given that it has been pre-approved by some reputed banks. Credit score: The credit score ranges from 300 to 900. The closer you are to 900, the more confidence the credit institution will have in your ability to repay the loan and hence, the better the chances of your application getting approved. Anything above 750 is considered a good credit score. All banks /NBFCs usually look at the credit score as one of the many checks they do before advancing a loan. With a good credit score, banks provide you with a lot of benefits, such as low-interest rate, higher loan amount, quicker loan approval process and higher repayment period. To enjoy all these benefits, the eligibility criterion is to have a credit score of 750 and above. Errors in your credit report can delay the loan approval process or at times result in rejection of loan. So, it is better that you check your credit score before going for a loan, to avoid any unnecessary delay. You can buy your credit report along with the credit score from CIBIL. The fastest way of getting your CIBIL credit report is through online. You need to pay fees of Rs. 500 to get your credit report online. 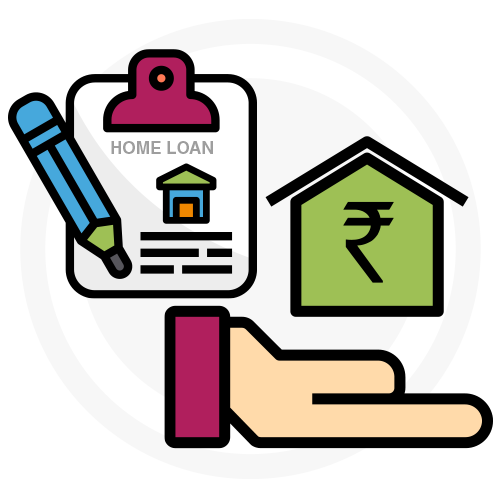 How does home loan help me save money from taxes? This section provides tax deduction for the amount paid by an individual towards repayment of the principal amount of home loan. The maximum tax rebate allowed is 1.5 lacs under this section. This section entails tax benefits on interest paid on home loan. The maximum tax benefit is 2 lacs for a self-occupied property. The home loan can be used to cover cost of construction, repair, or purchase of a property. In case of a rented out property, there is no upper limit for seeking rebate. In this case, the entire interest paid on the home loan is eligible for rebate. The benefit is available till repayment of the home loan.